The museum was built and is still maintained entirely by volunteers. Without volunteers there would be no Atlantikwall-Museum. The museum therefore always welcomes new applicant volunteers! can do this in his or her own way, by making use of his or her specific skills. 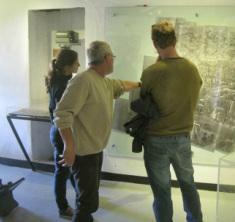 If you are for example, interested in the history of the Second World War, you may be able to become a tour guide. We can also use your help in administrative activities. Are you excited to become a volunteer? Then please fill out this form and use your message to motivate why you want to become a volunteer.